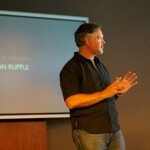 Dan Rupple is a unique voice to the Christian community. Informed by thirty-five plus years at the highest levels of the entertainment industry and his rich, ministry experiences as an ordained pastor, Dan combines his deep understanding of cultural movements with the heartfelt needs of the human soul. With an uncanny ability to forecast future trends, Dan’s insights have revolutionized numerous Christian organizations and ministries, launched the careers of some of our leading filmmakers and comedians and provided a fresh Kingdom vision to Christian life in the Digital Age. The Impact of Media on the Family, Church and Culture. We are in the midst of a convergent media revolution! Television is being re-invented and Digital Media has matured from infancy to the hard to predict behavior of adolescence. The overriding truth that always remain…THE STORY’S THE THING… the right story, for the right audience, on the right platform. Your organization needs a forward thinking media strategy in step with the ever-changing landscape of the digital age. We will carefully lay out a convergent strategy that will bring social media, on-line video and broadcast television into harmony to best serve your objectives.With vast network television experience as Supervising Producer for CBS, a recognized pioneer in the advancement of Christian media, and as a successful independent producer with over 150 digital videos for leading corporations and organizations; Dan is uniquely qualified to lead your organization into the digital age. As a media speaker and adjunct professor, Dan remains an avid student of media history and current media trends, not merely asking how does our culture consume and engage with media, but WHY? Innovation in technology is born of cultural need. Understanding your targeted audience through a lens of insightful media knowledge keeps Dan on the cutting edge of media relevance.Your organization has amazing stories that need to be told!…Let us help you maximize your voice in the digital universe.